For CPR Certification in Indiana, Abstract Theory Group provides American Heart Association CPR Certification Classes in Lafayette or at your location. CPR (Cardiopulmonary Resuscitation) and AED (Automated External Defibrillator) training are important safeguards for public health and safety and could save the lives of thousands of people each year. Immediate CPR can double or even triple a victim’s chances for survival and it does not require a professional to perform this emergency service. Abstract Theory Group is your source for American Heart Association CPR training in Indiana. We offer classes at our offices in Lafayette or come to your site for the ease and convenience of your group. This is especially important for people who work with the public on a regular basis. While some workplaces require CPR/ AED certification in Indiana and other States, there are many who merely recommend it. With CPR certification in Indiana, you can make your workplace safer. The statistics are quite sobering. It is estimated that over 1.5 million heart attacks occur each year and many as 90% die before medical help can arrive. Additionally, other accidents that may cause the heart to stop affect not only adults but also children and include drowning, electric shock, choking and severe allergic reactions. Up to 200,000 accident and injury victims could be saved if CPR was administered early enough. This is why we at Abstract Theory Group provide CPR Certification in Lafayette. We join the American Heart Association in urging everyone to learn CPR because you never know when it may help you save someone’s life. By obtaining a CPR certification in Lafayette, Indiana, you can help your community a better and safer place to live in. We follow the 2010 American Heart Association Guidelines for Cardiopulmonary Resuscitation and Emergency Cardiovascular Care in our classes. 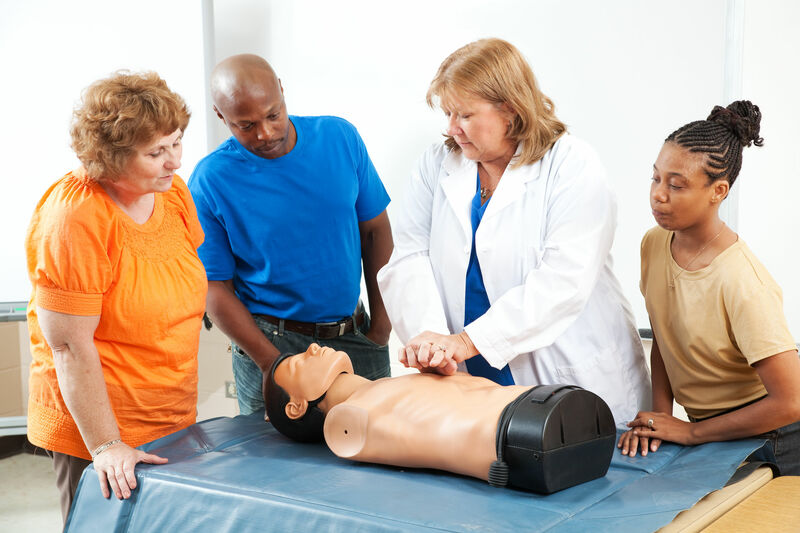 With class sizes limited to 9 participants, each person is able to work with a manikin under the guidance of a certified instructor for hands on experience. Along with standard CPR training, we also offer optional modules in child and infant CPR and AED use as well as training for dealing with children choking. Our CPR certification classes meet the Indiana Department of Education requirements for teachers as well as OSHA guidelines for the workplace. Our scheduling is flexible and the price is reasonable - $50.00 for the 3 hour class – and group discounts are available. CPR certification in Indiana is issued within 48 hours of the completion of the class and replacements are also available for a $5.00 fee. All that is required is to read the AHA CPR book that is included in your fee and dress comfortably to be able to participate in class. For convenient CPR Certification classes in Lafayette, Indiana and the surrounding area, contact Abstract Theory Group today.